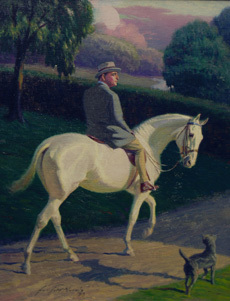 2011 Art Auction sale-topper was the 1923 Oil on Canvas of Julius Fleischmann by George Ford Morris. The Museum is pleased to announce it will be holding the 2019 Equine Art, Antique, and Rare Book Auction on Saturday, June 8, 2019 at 11:00 a.m. at the American Saddlebred Museum on the grounds of the Kentucky Horse Park. An art preview will be available one week in advance from June 3 – 7 from 9:00 a.m. – 5:00 p.m. and one hour before the sale on June 8. The Art, Antique, and Rare Book auction has earned its reputation as a venue at which a variety of serious equine artwork, antiques, collectibles, rare books, and historic artifacts can be purchased. Artwork in all media is considered and work includes oils, watercolors, pastels, charcoals, bronze sculptures, vintage posters, lithographs, and stained glass. The focus of the auction is particularly Saddlebred items, but coaching, Thoroughbred, Standardbred, draft horse, Hackney and Morgan artwork are included. The auction draws and specializes in works by George Ford Morris, and has expanded to include any sporting subject by Morris. In addition to Morris, other artists represented in the 2019 auction include W. S. Vanderbilt Allen, John Thomas Berry, Edwin Bogucki, Anne Crawford, James L. Crow, Alvin Dover, Susan Dudula, J. B. Greuze, Helen Hayes, J. F. Herring, Martha Huff, Sally McClure Jackson, Maretta Kennedy, Hooshang Khorasani, Jane B. Meyer, Jeanne Newton, Wyatt Lilly, Edward Penfield, Jessie Pettie, Karen Pierre, Gwen Reardon, Fred S. Tolman, George Singerly, Henry Stull, T. Clarence Underwood, and Frank Whitney. If you are interested in reviewing a 2019 auction catalog, please email [email protected] or call (859) 259-2746.